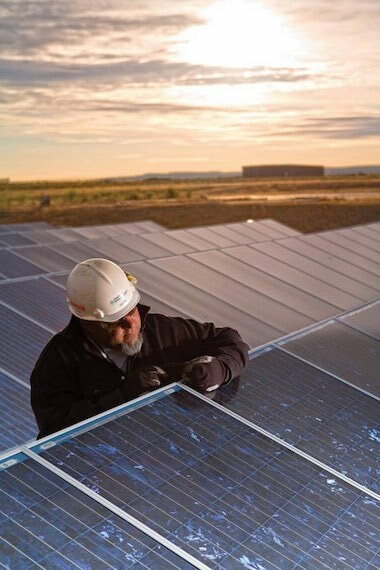 Recent news that a French company, Neoen, is planning to build the state’s largest utility solar power operation near Richland is both exciting and affirming. The property chosen for the massive project used to belong to the Department of Energy. It is part of a total of 1,641 acres of unused land from the Hanford nuclear reservation that was transferred to the community in 2015 -- a monumental deal that took years to negotiate. This is the first development planned on the transferred land. Site studies have begun for the proposed 20-megawatt solar project to be built by Neoen. If all goes well, the new solar power system should be up and running by 2019. This is exactly the kind of infusion community leaders envisioned when they pursued the land transfer agreement. Of the property that was transferred, 300 acres went to Energy Northwest with the understanding that approximately 100 of those acres would be set aside for a potential solar project developer. The rest of the land -- 1,341 acres -- is to be used to attract new business and industry. There was no reason for DOE to hang on to Hanford land that was not needed for its cleanup mission. But it took the combined forces of the Tri-City Development Council, Benton County, the Port of Benton, and the City of Richland to make it happen. It also took an incredible amount of pull from former Congressman Doc Hastings, and Senators Patty Murray and Maria Cantwell. Hastings tried several times to get federal legislation through that would require DOE to transfer the land to the community, and was successful just before he left office. At the time, we said it was one of his best, final achievements. Now, roughly two years later, geotechnical work is being done on the property to determine the best place to build the new solar plant. The parcel is two to three miles north of Richland, northwest of the 300 Area and south of the Columbia Generating Station nuclear power plant operated by Energy Northwest. He also said the solar project helps emphasize the community’s “brand” in the energy sector. Already, 40 percent of the state’s electricity is produced within 100 miles of the Tri-Cities. That includes nuclear, hydro and wind energy. In addition, Areva’s Richland plant produces nuclear fuel that supplies about 5 percent of the country’s electricity. While the Hanford Comprehensive Land Use Plan proposes saving about 90 percent of Hanford land for conservation and preservation as environmental cleanup is completed, solar power production seems like a good fit for part of the remaining 10 percent. It is a valuable technology that is becoming an important part of the country’s clean energy mix, and its future appears bright -- pun intended. Energy Northwest operates the White Bluffs Solar Station -- about seven miles north of the Neoen site -- and is planning to build another solar facility on Horn Rapids Road north of Richland. Now our community has snagged what will be the largest solar production plant in the state. The DOE-transferred land’s potential finally is starting to get tapped. It’s great to see persistence pay off.